Crisis is published by Tony Jasper.Correspondence, features, suggestions should be sent to tony.jasper@btinternet.com. An archive of all 69 past issues is available on line by going to www.jasperian.org/crisis-magazine. Issue 71 will list the content of all 70 issues. There is no charge or subscription for this magazine, and it will sent to you with relevant details that you make available and with your permission to send to comply under UK data protection. Crisis is mainly concerned with the Arts and popular culture and offers a broad Christian perspective, it also takes contributions from some writers who write from a different standpoint or are simply commenting and reviewing within disciplines of an art form. Unless stated all material is by Tony Jasper. Originally set on guitar, but then piano to emphasize a gospel feel, Paul Simon’s much recorded song with Art Garfunkel,” Bridge Over Troubled Water” has a new lease of life. The beautiful singer Katie Melua has recorded it on her praiseworthy double CD, Ultimate Collection (BMG). In music history the original version of this song from its birth in 1970 has topped the charts in ten countries, collected Emmy Awards, and sold in excess of 25 miillion copies. By 1974 over 80 artist ‘covers’ were listed. Recording artists of this song have spanned many musical genres from Elvis to Aretha Franklin to Bob Marley to Leona Lewis to gospel choirs, and countless unlisted, unrecorded, public performances by club singers and male voice choirs. Less known is the 1971 album Rock Gospel that brought together some of Motowns great names. On that set the Jacksons and Michael deliver an interesting version of “Bridge Over Troubed Water’. Singer Art Garfunkel says he’s sung it around six thousand or more times and every time “I get a little vistation of the power of a great song.” It was the last song recorded for the fifth and final album from Simon and Garfunkel. In the oft-practised method the recording took place in different studios, in this case the vocals were cut in New York and the instrumentation in California. The arrangement has often compared to Phil Spector’s work on “Ol’ Man River’ for the Righteous Brothers in which a gospel chorus is used but held back until the end for maximum impact. Many have been puzzled by the melodic line “Sail on silver girl” which someone obtusely makes reference to Simon’s wife of the time Peggy, who had grey hairs! The song preceded the album with the same name. To be sure there is plenty of feeling and emotion, but she does the song her way, with acoustic guitar introduction, and soon with strings serenading in the background. Her interpretation pulls things back, and you listen and hear something new. Her album is a double-set plus what is termed bonus tracks, of which ‘Bridge’ is one, and interestingly also has the Evie Sands emotive associated “Fields of Gold.” For less than a tenner, what can I say?! On this varied album she sings of “living out day at a time,” and her “politics living in a small jam/ living in a slow dance,” and asks to be led to the Garden of Eden’as she searches for sense today. She tells the New York Times “ W’re trying to figure it out, like a lot of us now, how do we move forward? How does one stay hopeful in life right now?” Not the easiest of albums to ‘take in’ but it rewards on a number of plays. This article first appeared in The Methodist Recorder, November 9. 2018. 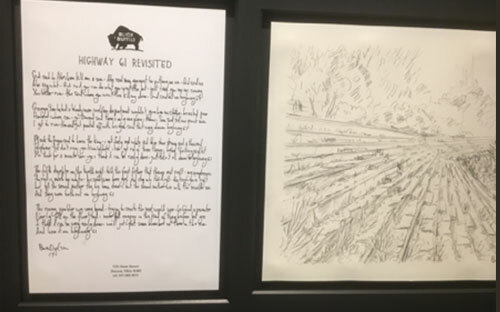 Rob Murdoch, a great Dylan scholar has been visting the special London display of painter Bob Dylan. All London – based Bob Dylan fans should every now and again say ‘Thank You’ to Bond Street’s Halcyon Gallery for its regular major exhibitions of Dylan’s work. 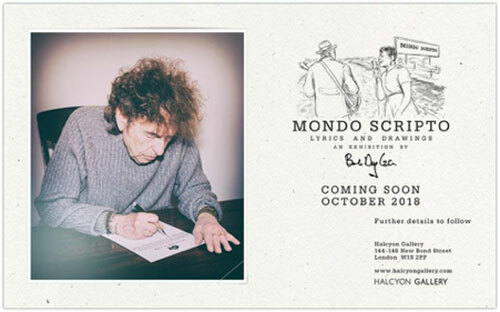 Crisis Magazine’s Dylan correspondent has, with his dearest companion, been to see the latest : Mondo Scripto, a collection of 60 handwritten song lyrics accompanied by pencilled sketches illustrating each theme or as often a specific line or phrase from the song. In many cases the original lyrics have been changed slightly here and there. Which is consistent with so many years’ live performances; he’s never been reluctant to change the lyrics from one tour to the next. As ever, a host of questions…but starting with an answer : if you have to ask the price, you should know you can’t afford them. Upwards of £90k, signed and authenticated, if you really must know. Although you can have a limited edition print for £2k. There’s plenty of money around Bond Street of course. The friendly and very helpful Halycon staffer who gave us a tour of the building, this exhibition and other original paintings and sculptures on the upper floors, may have thought I was an ageing bass player from an obscure band. Or even a well known band. She wouldn’t be the first. Apparently U2’s Bono and Led Zep’s Jimmy Page had preceded us. And Mondo Scripto – what does that mean? Let’s keep it simple : Scripted World. It fits. I’m hoping it’s not a nod towards that shocking and exploitative 1960s documentary film Mondo Cane, although as we know Bob has a long memory. Let’s have a look at a couple of the pieces. But be warned : these cribbed shots will let you see what it’s like; but this is an exhibition which really has to be seen to get its full impact. An all time favourite, Highway 61, but the sketch doesn’t look like a highway. It’s not, it’s cheap open air sports ground seating : the ‘bleachers’. The clue’s in the last verse of the text. The roving gambler is trying to create the next world war. He finds a promoter who thinks it can be very easlly done; “we’ll just put some bleachers out in the sun. And have it on Highway 61”. ‘All I Really Want to Do’…and this one’s a bit more obvious. 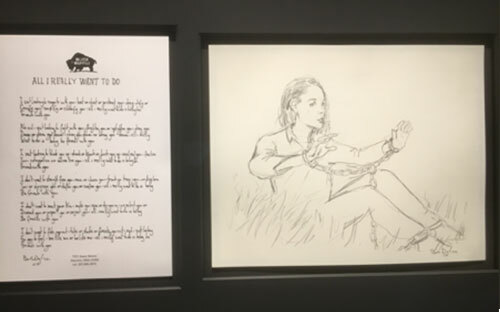 The girl is in chains, but (verse 3) Bob “ain’t looking…to lock her up”, all he really wants to do is be friends with her. One of the seducer’s lines since time began. As he said somewhere, songs are to be sung and heard, not read or looked at. Although some of the sketches are nice. Poetry Alive took place at London’s, Methodist Central Hall on Saturday November 17. The special guest was Lord Leslie Griffiths, a world renowed Methodist speaker. Christine Smith of Canterbury Press spoke about her role in publishing and love for poetry. A wide selection of poetry with a Christian and religious understanding was read by Emma Danby and Tony Jasper. Music was provided by Paul Hill. All three winners were present to receive certificates, cheques and the special Jack Clemo plaque, and which, since there were two people voted number one in the national ACG poetry competion named after the Cornishman, each will hold the plaque for six months. The winners were Susan Mansfield – Silence: Philip Burton – The Carpenter. In third place was Philip Burton. The relatively unknown Kingdom Choir were into rehearsal version 13 on the morning of the day when they sang one of those quasi-religious songs, Stand By Me, at the wedding of Prince Harry and Meghan Markle, now the Duke and Duchess of Sussex. The choir had leap – frogged more familiar gospel choirs for a wedding gig that went global., and ushering in the time of life for choir members who have a world tour beckoning. They will be known forever as the choir that sang for royalty on an historical occasion that saw gospel in song and no less powerfully gospel in words and preached for fourteen minutes by a brilliant black preacher Bishop Perry. Gibson, not able to spill the beans., other to say they had to be there, well, somewhere, on May 19..
And now with no surprise there comes a freshly recorded album (Sony) with gold colour adorning both the actual CD and the cardboard container into which it is placed., titled after the group, but with a wording on the front cover to remind one and all of the ‘event’ and naturally the title of the song. In terms of a concept to move beyond the one song everyone will associate them with the album contains broadly speaking songs of love, hope and inspiration. any doubt that this choir wishes you to follow Jesus. There is of course nothing new in a gospel choir treading into other than specifically religious fields for songs, and giving them a ‘gospel’ context, however wide, as for instance Britain’s leading Gospel outfit of many years standing, London Community Gospel Choir on their album Glorious BMG) or on soul pastures various volumes of Soul Gospel (Soul Jazz records) or another compilation ‘Soul Devotion’ (Polygram). As it is we get some of each, and so the album brings us ‘Lovely Day’ associated with Bill Withers, and Harvest for the World, a hit for the Isley Brothers in 2007, John Legend’s All Of Me, and the Aretha Franklin hit ‘I Say A Little Prayer’ which perhaps just makes it, in-spite of the word ‘prayer’ and perhaps included to remind us of her recent passng. In Gospel terms I love their ‘Blinded By Your Grace’ while they excell in a fiery take of J“You’re the Voice.” And yes, there is a strong take on ‘Hark the Herald Angels Sing’ to the familiar music of Mendelsson. Kingdom Choir deserve plaudits and high sales. great stuff people! A UK tour commences on Tuesday, April 30. 2019. However there are other releases quequing up to take the purchase. Prom Praise Christmas from the All Souls Orchestra (Integrity) conducted by the evergreen and so talented Noel Tredinnick, simply sparkles in innovative arrangements to familiar Christmas music. At times this is a veritable power-house with charging takes, including an early one to raise the roof on ‘Joy to the World’ and stridency to ‘God rest ye merry Gentlemen’ and from there taking us into a majestic ‘’O Come All Ye Faithful.’ There’s organ before strings on a rich sounding ‘It Came Upon the Midnight Clear’ . The relatively unknown “’From the Squalor 0f a Borrowed Stable’ has a lovely air although I am trifle uncertain about the drums. And yes, it’s a relaxed sprightly air to ‘Sleigh Ride’. This album - play it loud, open the windows, and you might catch a Mr Scrooge walking by. And who knows from there? I’m not cheap. But I’m cheaper than Tom Cruise. Period drama can sometimes feel like an exclusive club, which certain viewers don’t feel invited to. James Strong (directing Vanity Fair). Daily88 Telegraph. August 11. 2018. P4. New York magazine/ Observer.Rebecca Nicholson, People. Observer. August.12. 2018. P 41. I hate that description, though, that all female character we have now have to be ‘strong’. Sunday Times Culture. August 12. 2018. P 4. To suddenly have a bunch of episodes that go up at the same time, you have to tell a big story, And it’s been really fun. However it’s its own torture. Matt Groening (SImpsons creator) On his first show created for streaming services that can be consumed in a five hour binge. The older you get, the harder it is to play naivety because you know too much. So I’m kind of enjoying being older and pretending I know more than I do. Richard Madden. Marie Claire. September 2018. P82. Matt Grening. The ‘Simpson’s creator. New York Times August 14. 2018. P 14. If I’m appreciated for what I do as an actor or as an entertainer, then I wear that with pride and I’m thankful. Idris Elba. The Observer magazine August 19. 2018. P15. One you’v been labelled, or you’ve labelled yourself, one thing, you can’t be another. It’s so restrictive. And I just think.nah. Jade Anouka, Culture Sunday Times. August 26. 2018.P23. I like language that’s quotidian but poetic. I like that quality of strumbling into beauty, and then it’s gone. Greta Gerwig Observer The New Review February 4. 2018. P11. Hilary Swank. Guardian G2. August 30. 2018. P8.